Behringer manufactures a fine headphone amplifier. 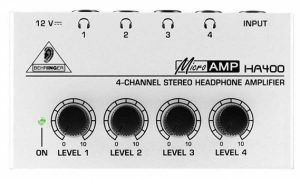 The HA400 is inexpensive (~$25) and provides 4 independent headphone channels. The quality of construction and ease of use make it a good alternative for multi-listener applications. However, while using the HA400 in the school club roundup with a 500 watt station, we found that RF was getting into the headphone stream. The resulting distortion was very annoying. The HA400 was intended for musician use and not designed for an RF environment. The unit is housed in a sturdy metal chassis and thus well shielded. The likely source of the RFI was the headphone cables and/or 12 volt power supply wallwart cable. Initially, clamp-on ferrites were installed on these offending cables but the ferrites only provided a partial solution. After opening the unit up and removing the circuit board it was clear what was contributing to the problem. 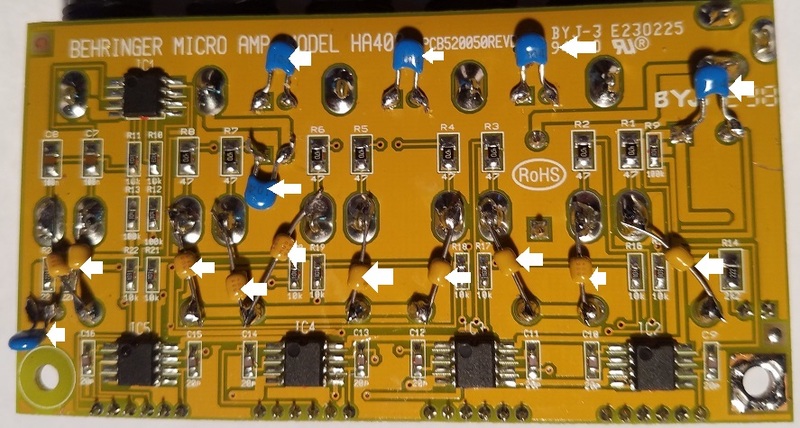 The HA400 is a relatively simple balanced input op amp audio circuit with individual volume controls. None of the input circuits, op amp inputs or power supply had any provisions for RF bypassing. For example, the 12 volt input has a large 1000 µf electrolytic capacitor for audio bypass but it is unbypassed for RF. Likewise the audio circuits had unbypassed eletrolytics and the op amp inputs were unbypassed. All these are candidates for 0.1µf bypass capacitors. This figure shows the installed capacitors. With the installation of these capacitors and external clamp-on ferrites, all of the RFI has disappeared from the HA400.